I hope everyone had a lovely bank holiday weekend. I know I sure did as I spent it with my family enjoying the fun fair eating ice cream and having lots of laughs with my family, what could be better? Anyways I am a big fan of trying new foods and one of the places I loved to get my weekly treats was tantrum doughnuts. 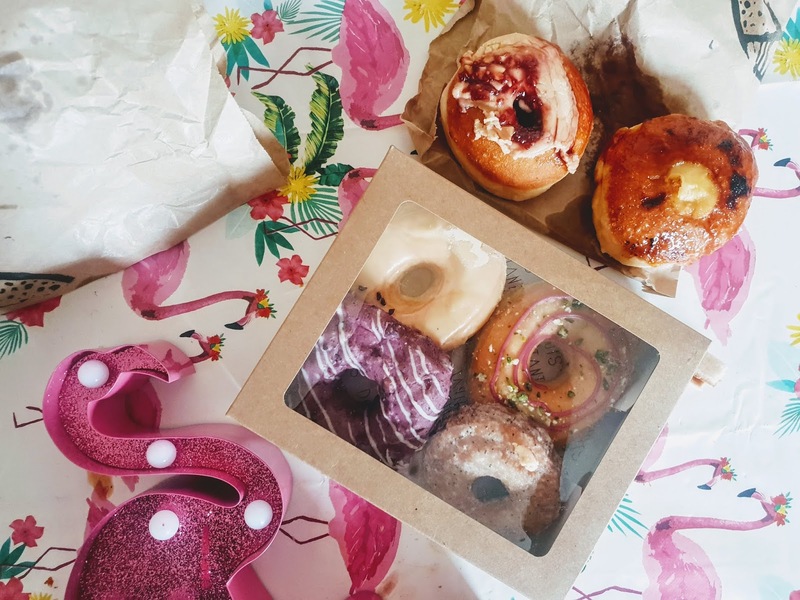 Tantrum Doughnuts is an award-winning doughnut shop based in Glasgow and was founded in 2015. The doughnuts are so delicious looking that they would make Homer Simpson jealous that they had to expand to 2 shops to meet demand. All of their doughnuts are handmade and with traditional bakery, techniques compared to mainstream factory-produced doughnuts. Each doughnut is made with a yeast-raised brioche bun which is proofed for 16 hours to develop the flavour; talk about dedication eh? I have loved doughnuts for as long as I can remember and my all time favourite doughnut I've had was when I went to Mexico City when I was 15. The doughnut I had was made in a small shop and it was bright pink with pink sprinkles on top and my goodness it was huge and the most delicious doughnut ever. Tantrum doughnuts have 2 locations but the one I went to is in the west end on old Dumbarton road. The shop is small but it inviting as the decor is lovely and you can see all the doughnuts and drinks they have available in a glass case and also on the chalkboard above the counter. You can eat inside the shop even though they aren't a lot of room; if you can find a seat its possible. You can take out as they put the doughnuts you choose nicely into boxes or a bag. If you buy a dozen or more they take 10% off. They also have a selection of hot and cold drinks. So what did I choose? I choose a selection of doughnuts to give a try with my family. I think I got most of the menu LOL. I have to admit I love how unique the flavours of these doughnuts are. I have never tried most of these kinda flavours before trying tantrum doughnuts. I didn't know which doughnut to start with first because they all look so fluffy and delicious to eat! I just chose pistachio and hibiscus first because I just love pink and my goodness does I love pistachios, they are just delicious that I could demolish a packet in no time. Vanilla Creme Brulee If you love the taste of creme brulee then this is the doughnut for you as inside the doughnut its filled with a soft delicious vanilla centre. I am not the biggest fan of creme brulee but my son loved the crispy outer of this doughnut and soft centre of this doughnut. Pistachio & Hibiscus Ring Can I have a crate of these doughnuts, please? 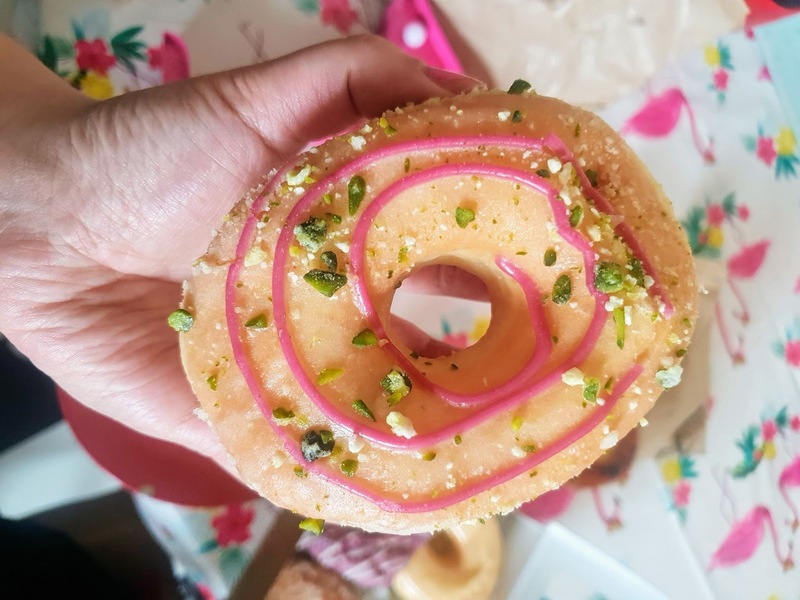 Honestly, this doughnut is so delicious, it has a pistachio glaze and hibiscus reduced with a topping of crunchy candied pistachios. 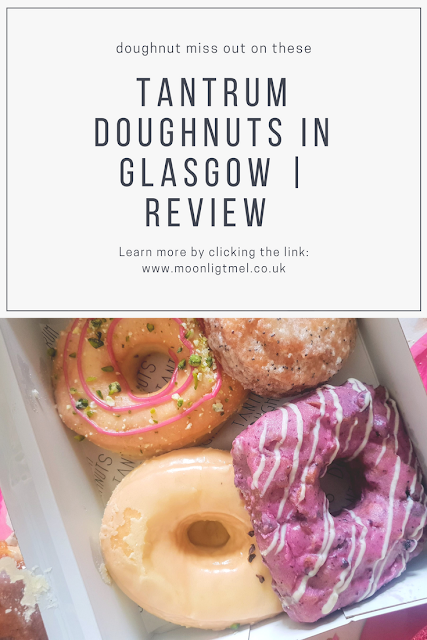 If you ever visit Glasgow I would definitely recommend this doughnut. Peanut Butter and Jam It's peanut butter jelly time! Lovelies if you love peanut butter teamed with jam then this doughnut is for you! It has a lovely topping of thick but creamy peanut butter and a centre of homemade raspberry jam. Lemon and Poppyseed 'old fashioned' This is an old-fashioned buttermilk style doughnut with a poppy seed and lemon glaze. I can't say I am a huge fan of this as I found it a little bitter but my stepdad just loved it as he loves more citrus flavoured things. Tonka Bean and Orange oil ring This doughnut is infused with tonka bean and orange oil. As I said above I am not the biggest fan of citrus things but if you love citrus with a hint of sweetness then this is definitely for you. Almond Glaze buttermilk 'old fashioned' This is a buttermilk style doughnut with an almond glaze. I would love to tell you what this tasted like but my kid's dad just loves this doughnut as it was nutty yet milky in taste. Double blueberry and white chocolate I have never seen a square doughnut before but they are a first time for everything! This doughnut is a buttermilk style doughnut with fresh blueberries, blueberry jam glaze and white chocolate. This doughnut kinda reminded me of a blueberry muffin, very satisfying. I enjoy getting doughnuts here from time to time as its nice to support an inprendent store rather than just getting the usual store-bought doughnuts. 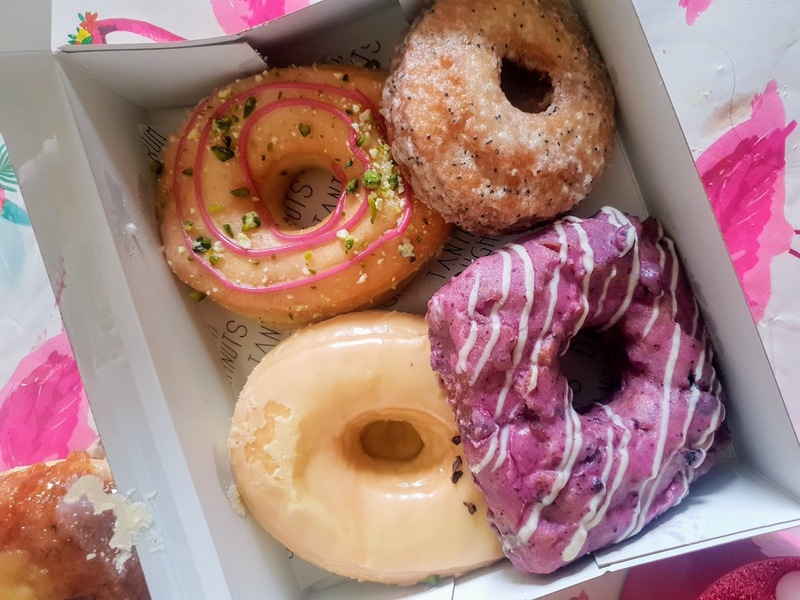 These doughnuts are a bit more expensive than store-bought ingredients but the prices can be justified because of the flavours they have to offer and all the doughnuts are handmade every day. I can't say I loved all the flavours but then again I can be super fussy at some points but I did love most of the doughnuts I bought and if I didn't my family sure did. I would definitely recommend giving their doughnuts a try with a fresh coffee. Do you like doughnuts? if so what is your favourite flavour?